The two-storey Hall dates from the 15th century and was built for the Guild of St Anthony, with a banqueting hall over a chapel and hospital. After the Guild was dissolved in 1627 the hall served as a meeting place for those guilds of York which had no guild hall of their own and later as a venue for the performance of mystery plays, archery practice, a munitions store, house of correction and a military hospital (after the Battle of Marston Moor in 1644). The Blue Coat School was founded by the City Corporation in 1705 to provide tuition, clothing and lodging for orphans and children of the poor. It was supported by regular subscriptions by the clergy, gentry and well-to-do citizens of York as a form of benevolence and in the belief that it would instil discipline and religion into the children of the impoverished and keep them away from the vices of sloth, beggary and debauchery. Lessons were given in the main hall. Meals were taken and sleeping accommodation provided in the side aisles. Kitchen and washing facilities, administration etc. were on the ground floor. Initially for boys only, starting with 40 in 1705 and peaking at 84 in 1872, it provided schooling in religion and the 3 R’s and taught skills such as weaving and spinning and training for apprenticeships at sea and for domestic service. Girls were provided for at its sister establishment, the Grey Coat School, first in Marygate and later in Monkgate and 1924 lessons for both sexes were provided at St Anthony’s Hall although the girls continued to live in Monkgate. Outgrowing the confines of St Anthony’s Hall the school expanded into the series of buildings surrounding the courtyard which were constructed towards the end of the 19th century. The first, the east wing, is of red brick with a slate roof. It is of two storeys, with segmental arched windows openings fitted with vertical sliding sash windows and two prominent chimney stacks on the courtyard elevation. It was designed by JB and W Atkinson around 1870, originally with classrooms at ground level with a dormitory above. A single storey section at the north end contained privies. The second, west range, extending along Aldwark from the corner of the Hall was designed by Demaine and Brierley in 1887 and incorporated sections of an 18th century house. Some of its bricked up openings are still visible on the courtyard side. It contained a ground floor drying room and larder with two floors of dormitories above. It is built of red brick with a slate roof and exhibits various brick bonding patterns, including English Garden Wall, Flemish and English Cross Bond. It has casement windows with small panes, moulded brick features and pedimented gables. The narrow carriage arch which provides access from Aldwark was widened by York Conservation Trust in 2006 reusing the original moulded hood bricks, bullnose brick jambs and stone hinge blocks and with replica timber gates on the original forged hinges. This range was extended in similar style by the same architects in 1901, also over three storeys, with a workshop at ground level and more dormitories above. The corner staircase and the two-,storey flat roofed, north wing were constructed at the same time. This wing contained a bakehouse, brushing shed (for boots?) and a coke store with a dormitory over, later used as a chemistry laboratory. The pupils wore characteristic uniforms (blue coats, yellow breeches and round hats) based on the those of Christ’s Hospital in London at all times, when out in the town and when attending church services and civic events to maintain a public profile which encouraged new subscriptions and reminded the populace of their benevolence. The school closed in 1947 after 240 years and the buildings including St Anthony’s Hall were sold back to the City Council for the sum of £9,000. 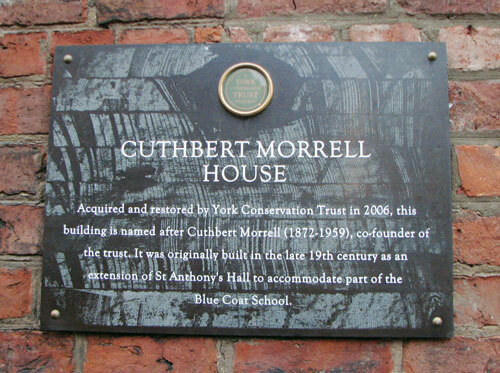 From the early 1950’s until it moved to purpose-built accommodation at the University of York campus at Heslington in 2005 the buildings were occupied by the Borthwick Institute for Historical Research. 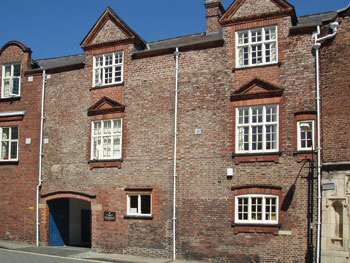 The buildings were purchased by the York Conservation Trust from the City Council in 2006. 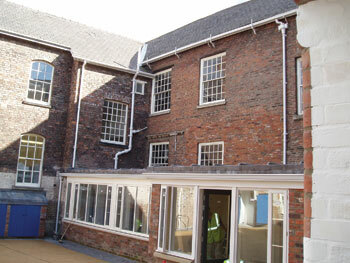 Extensive renovations and alterations by the Trust have given the three ranges around the courtyard a new lease of life as the headquarters of the York Archaeological Trust.